Cruising through the tiniest of lanes in north Bangalore through the areas of Malleshwaram, Rajajinagar, Gayathri nagar, L N Puram, Subramanyanagar, he covered a distance of almost 20 kilo metres on a two-wheeler. Sporting a smile, waving out to onlookers, requesting them to support him, Bharatiya Janata Party MP H N Ananth Kumar campaigned for the upcoming elections. He was riding a black Honda Dio with Malleshwaram MLA Dr C N Ashwath Narayan riding pillion, and more than a 100 party workers in tow. After more than two-hours of meeting, interacting and biking through the streets, he finally gets back to his car for the interview. Clad in a baby blue kurta-pyjama and orange angavastra around his neck, he sits in the front seat and turns around to face me seated in the back. After formal introductions and some awkward silence, I finally started off the conversation with Kumar. Vaishnavi Vittal: You are a former Union Minister for Urban Development and Poverty Alleviation. What is your assessment of urban planning in Bangalore? What has gone well and what has gone wrong? Ananth Kumar: What has gone wrong? Population explosion. We barely begin the interview when a by-stander waves out to him. He says, “Thank you, sir. Thank you”, leaving the by-stander with a big smile. AK: People of Bangalore just love me. I don’t know why. Romance. As we drive through the streets, accompanied by a body guard, personal secretary, party worker, all seated in silence with the occasional ringing of a cell phone, he quickly resumes his answer. AK: One is population explosion. In a city which was planned for 4 lakh citizens, it is now touching a crore. And vehicle population is 37 lakhs. Therefore the only move forward is to create localities in the suburbs and neighbourhoods and build fast track public transport system into traffic dense corridors, from suburbs to city centre and back, mass rapid transport system, that is Metro. I brought Metro to Bangalore because I think that is the only viable public transport solution for Bangalore which can take off 40 per cent of the road traffic. And otherwise through ABIDe, as Vice Chairman, you have been seeing that hundreds of roads are being widened, flyovers, underpasses, grade separators, everything is simultaneously planned. And I feel traffic, power, water and environment. We need a dedicated power plant for Bangalore, 5000 MW, so that we can take off the pressure of Bangalore from the main grid. And it can provide dedicated power to Bangalore – uninterrupted. Secondly, now what we are getting is around 900MLD (of water) per day. But that is not sufficient. We need to go for Cauvery 5th stage, 6th stage, so that there will be sufficient water. I have already spoken to you about traffic, Metro and other mass rapid transport systems. And environment, can we resurrect one of the three rivers of Bangalore -Swarnavathi, Arkavathi and Vrishabhavathi? Can we create a riverfront from Bangalore? You may feel that it is far fetched but if Narendra Modi can do it in Ahmedabad and create a riverfront, why not we? And secondly can we resurrect one of the rajakaluves? It was during Ananth Kumar’s tenure as Union Minister for Urban Development and Poverty Alleviation that he set up the committee for urban transportation to examine the Metro rail project for Bangalore, Mumbai, Hyderabad, Kochi, Thiruvananthapuram and Lucknow. In 2003, when S M Krishna was the Chief Minister of Karnataka, he involved the Delhi Metro Rail Corporation. Both Kumar and Krishna were keen on bringing Metro to Bangalore. Citizen Matters has been tracking the Metro from progress of the project itself to the status of relocation packages for displaced traders. See here for more. Kumar is wrong in referring to the need to go for Cauvery 5th and 6th stage. The Cauvery Water Tribunal has already allocated a specific share of water to Bangalore. In the absence of a reallocation, the Cauvery Water Supply Scheme Stage 4 Phase 2 will be the last of the schemes that Bangalore can have. There is simply no way to get more water to Bangalore; no more schemes can be taken beyond Stage 4 Phase 2. In between his answers, he continues to wave out to people on the roads through the window, as they greet him back with smiles and waves. Dusk is setting in. As the driver looks for a parking spot, people wave out to him. He responds “Thank you. Thank you, sir”. He tells party worker Venki to get four plates of idly and vada from an eatery near the Kadu Malleshwara temple in Malleshwaram, as we remain seated in the car. People continue staring in his direction, some smiling and waving. His campaigning never stops as he says, “Thank you, sir. Please support”. A lady walks up to the car. “Namaskara amma. Hegidheeri? BJP ge vote haaki.” The lady introduces herself and Kumar enquires about her and her family. “Nice meeting you”, he tells her and turns around to me again and we get back to work. I wanted to stay on the Bangalore topic, and ask him a related question from a different vantage point. VV: What is your view on the state of affairs in Bangalore, as a senior BJP leader, as the ABIDe Committee Vice chairman and as an MP looking at a fifth consecutive term? AK: A lot has been done. And a lot remains to be done. Because when I first became MP in 1999 we had one million vehicles. Now we have about 3.7 million vehicles. The challenges have tripled or quadrupled. Not the resources and planning. That is the challenge. VV: What is the sense that you got today when you were riding the bike? AK: We will win. Ek ishaara kaafi hai (one sign is enough). The old lady, the coolie, the common man, just a small smile and many women, shy natured, when they look like this (he imitates the way they look at him). So when I don’t get that, I know that I’m in trouble. In some of the constituencies I don’t get. I can smell and tell. Everytime, I have given the results to the media very perfectly. VV: This year you have Krishna Byregowda, Capt Gopinath and a lot of independent candidates contesting from Bangalore south. AK: (19)67 onwards. In (19)67, only one independent, Dattatreya, won from North Kanara, after that no independent has even got deposit anywhere in Karnataka. True, D D Dattatreya, an independent candidate, won the 1967 Lok Sabha elections from north Kanara, and no independent candidate in the state has won since. Kumar goes on to talk about how the common man is ‘enlightened’ and will not ‘waste’ his vote on the wrong person. (Quotes inserted). He also talks about how, in previous elections, the media tried to tarnish his image. AK: This election is ok, in the last couple of elections, some sections of media went hammer and tong. Wrote all types of stories. Nothing happened. People just did not believe. People did not ask me a single question also. Media was totally perturbed, some section of the media. They thought at least I will be embarrassed, they will be asking questions. Ananth, woh aise likhthe hai, sometimes it happens if you have a Teflon image. It is known as Teflon image. Ho jaatha hai. But they know one thing, that I’m extremely mobile, accessible and I have fought for the cause of Karnataka and Bangalore. Therefore, they have termed me as Voice of Karnataka. It is dark by now. But passers-by still peer through the window and recognize him. He tells me why. AK: That is because of three reasons – my balding head, my nose and third is my protruding teeth and moustache, they know that this comical figure can only be Ananth Kumar. Shall I tell you one thing? Our people are very good. They don’t want anything. They only want love and affection. They don’t want you to be throwing around your weight and air, all those things. If you are simple and normal, people just love you. You have to be simple and normal. He tells me that people approach him with all kinds of problems. “Our people want only thing. I have observed one thing – they want your truthful attempt, honest attempt. If you are not doing honest attempt, they are peeved off.” We finish the idly vada and hand over our plates. “Superb, Venki,” he says and asks for a cup of sugarless coffee. I stay on the policy topic. VV: How will you try to influence urban planning and development policy if you become an MP, and more a Minister again? AK: I have already announced that I am going to have a Bangalore Action Plan with five components. Just then, a young man knocks on his window and introduces himself and his group of friends, all engineering students. “Yella support maadi.” “Khanditha, sir. Namma support nimage ide. Bahala santhosha aayithu,” the student says and they leave. As he sips on the sugarless coffee, we continue. AK: First, component is citizen-centric governance and a separate law for Bangalore. As on today BBMP is a creation of an amendment to the 1975 Corporation Act, whereas Chennai, Kolkata, all other metropolitans have their own law. So even Bangalore needs to have a law, which makes the governance citizen-centric. Secondly, we need to upgrade our public delivery systems by capacity building for providing better services. Thirdly, we need to create world-class infrastructure. Fourthly, there has to be a special planning for urban poor and their quality life. Fifthly, heritage and environment has to be a priority. For example, resurrecting 150 lakes, one of the rivers, raja kaluves, bringing back the vision of nadaprabhu Kempegowda. Nadaprabhu Kempegowda had a wonderful vision, he built Bangalore with rivers, with raj canals, with water tanks, beautiful air condition. That is the main ambition. The Bangalore Municipal Corporation was expanded in 2007 under the provisions of the Karnataka Municipal Corporation Act, 1964 and not the 1975 Corporation Act as mentioned by Kumar. BBMP formally came into existence in 2008. A group of students pass by the car, waving out to him. AK: Youth. Some candidates tell ‘youth’. They are telling youth na. I went to jail at the age of 16 in the JP movement. I was the state secretary and national secretary of ABVP. And I was the youngest cabinet union minister in the last 53 years when I became a cabinet minister and I’m just 49 now. (He gets a phone call) Therefore, if some party has created an economic mess, security mess, in which culprits like Afzal Guru are protected, and getting pardoned, when youngsters like Sandeep Unnikrishnan are becoming martyred, youth don’t like that. And economy, you said you will provide 1 crore jobs and in six months, 2 crore jobs have been lost – in IT, BT, manufacturing, textile, automobile, construction, in every sector. National economy is crippling. I don’t think any youth will vote for them. Therefore, youth is not physical age, youth is the aspiration. Therefore, to somebody I was telling, the three national youth movements were created, one by Mahatma Gandhi, during freedom struggle, the entire youth followed him, second is Jayaprakash Narayan, at the age of 77, ailing and on dialysis, he created world’s biggest youth movement in the country and L K Advani in Rama Rath Yatra. Youth always goes with ideology and idealism not by physical age. Why did people go with Jayaprakash Narayan when he was on dialysis? Lakhs went. The entire youth movement was led by him. I tried to keep the conversation on his current campaign and again to specifics. VV: When you vote on various Bills in parliament as MP, are you going to consult the voters of Bangalore south? And how? If your party whip asks you to vote a certain way, and your constituency voters majority view is the opposite, how will you vote? AK: No No No. Usually nowadays all the bills are put on website and the concerned people, because all bills do not concern everybody, concerned sections approach us. For example, life insurance, all the life insurance employees came to me. Therefore, throughout the country, all the MPs will get a feel, a sense. Pulse to mil jayega. You don’t say anything. As soon as the bill is introduced or before introduction, you get ten phone calls. Saab, aise aanewala hai, theek nahi hain. People are vigilant. VV: With the crash in the markets, the real estate sector has started talking about affordable housing. As an MP and Minister and witness to the fact the low income housing close to places of work is in shortage in Bangalore, what would you propose to do? AK: No No, we want housing. The country needs three crore houses. Three and a half crore families do not have pucca housing. In that, 50 per cent is in urban areas. Therefore, the building of houses for urban poor has to be taken on a mission now. That’s what I did when I was the Urban Development Minister. That has to be pursued again. AK: If our government would have continued, we would have done that. Because we could build only 70 lakh houses, that is more than what Congress built in the last 50 years. Six years, we built 70 lakh houses across the country. But three and a quarter crore houses are required. Then, suddenly we lost governance. And in last five years they (the UPA) have done nothing. Roads, they have not done anything. River linking they have not done anything. Pradhan Mantri Gram Sadak Yojana is totally closed. Awaaz Yojana is closed. Vajpayee invested 5.5 lakh crores in the national economy. They have sucked three and a half lakh crores from national economy. Therefore, we are in doldrums. Time is up and he has to head to another appointment. One last question. VV: What do you propose to do for the people of south Bangalore? Why should they vote for you? What are you giving them that others would not? AK: Here is a member of parliament – tried, tested and trusted. As a person who is for the all round development of Bangalore and a person who wants to make it clean, green and with citizen-friendly governance and public service system and I want to make Bangalore as a role model metropolitan in the country, best place to live in. VV: Thank you. Nice meeting you. It was a pleasure. The city was witness to its second edition of Neralu, the urban tree festival on February 7th and 8th. Here’s what Bengalurians had to say about their experience. 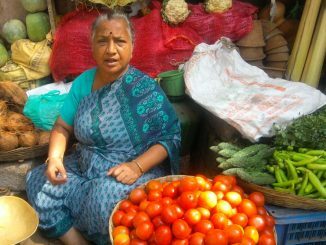 Bengaluru’s markets: Going, going, gone? What irks the vendors of Gandhi Bazaar, Malleshwaram and Jayanagar is not old giving way for the new. It’s being treated as if they don’t exist. As an introductory glimpse to the ongoing Dhaatu Puppet Festival which is taking place at National Gallery of Modern Art, two puppetry shows were staged on May 6th. He cleverly dodges answering the question on his rival candidates. It looks like he considers the young and dynamic Krishna Byregowda as a formidable rival. Great work on the interview. Although his views on the youth lack clarity.